(Pig Exploitation - Factory Farming - 37) These are really cute little piggies, aren't they? Do you know what is done to them? 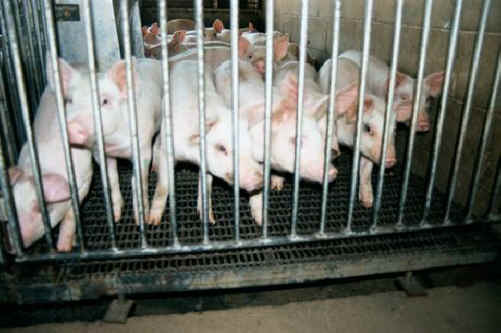 90% of male pigs are castrated before they are weaned. Many have their ears notched when they are 3-days old. 80% have their tails docked. Many have their eight sharp teeth cut when they are 24 hours old. We can also sense the degree of mercy and compassion of these factory farmers by the fact that they perform these mutilations without any anesthesia. Every person who eats pork, ham, bacon, or any other pork product participates in these cruel mutilations by providing a demand for more piggies to torture.